Pirates of the Caribbean: The Curse of the Black Pearl, was a wonderfully fun amusement park ride (literally) of a movie that blew into theaters three years ago. The sequel, well, is pretty much the same thing, but more. Therein lies the problem with this sequel, as well as others. The first movie was original. It blended together action, adventure, a bit of romance, and a truly weird Academy Award nominated performance from Johnny Depp (Corpse Bride, Charlie and the Chocolate Factory) as Captain Jack Sparrow. The sequel tries to recapture this same magic, but there is something that feels very unnatural and manufactured. The spontaneity is gone, replaced by lots more action sequences, lots more one-liners, and an annoying cliffhanger ending that sets up the third and final movie. All of the players are back, both in front of and behind the camera. Director Gore Verbinski (The Weather Man, Pirates of the Caribbean: The Curse of the Black Pearl) and screenwriters Ted Elliott and Terry Rossi (The Legend of Zorro, Pirates of the Caribbean: The Curse of the Black Pearl) create an overly long movie that is a hyperactive cousin of the original. It's still entertaining, but it takes a while for the story to get moving, then when it does, feels a bit empty. Instead of one big story bringing things together, Dead Man's Chest feels like a series of action sequences (albeit thrilling action sequences) strung together with familiar characters. 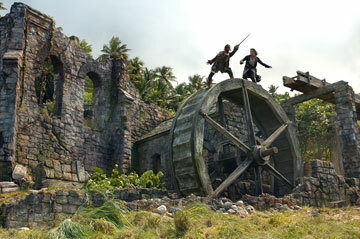 The plot starts with Will Turner's (Orlando Bloom, Elizabethtown, Kingdom of Heaven) search for Sparrow. Turner and his fiancee Elizabeth Swann (Keira Knightley, Domino, Pride & Prejudice) are to receive the death sentence unless they retrieve Sparrow's compass. The search for Sparrow is anticlimactic. 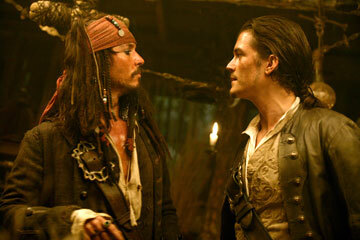 Sparrow agrees to give the compass to Turner if Turner helps Sparrow locate the key which opens the Dead Man's chest. Sparrow has a debt to pay to Davey Jones (Bill Nighy, Underworld: Evolution, The Constant Gardener), and the chest is his key to freedom. Along the way, there is an incredible amount of double and triple crossing, with each character trying to further their own agenda. Missing is the sense of freshness. Depp is still fantastic as Sparrow, but it feels a bit stale. Verbinski seems more concerned with trying to outdo to the original with action scenes instead of writing a compelling story. Again, there are some great sequences, including an early one with the crew of the Black Pearl captured on an island, and one late in the film consisting of a prolonged three-way sword fight. The loud moments work, the quiet moments, or any requiring emotion, fall a bit flat. The biggest accomplishment of the filmmakers is how they manage to bring all the principal characters of the first film, and some of the supporting ones, together in a way that for the most part, is logical and natural. Dead Man's Chest is a great looking film, with lots of detail in its varied sets, from Caribbean ports of call and remote islands, to dilapidated ships and houses of voodoo. Jones and his cursed crew look good, and the only special effect that looks fake is the giant kraken. This movie screams sensory overload and there is enough going on to distract viewers from the lack of substance. It's a big summer movie that is fun, but empty. 2 hours, 25 minutes, Rated PG-13 for intense sequences of adventure violence, including frightening images.